For my final project this semester, I decided to make an iPad smart mirror. My inspiration for this project came from researching cool DIY projects on the internet and I stumbled across smart mirrors. I immediately thought that this would be a great idea for me because it is a project that has multiple functions and has a longer lifetime than just this semester. 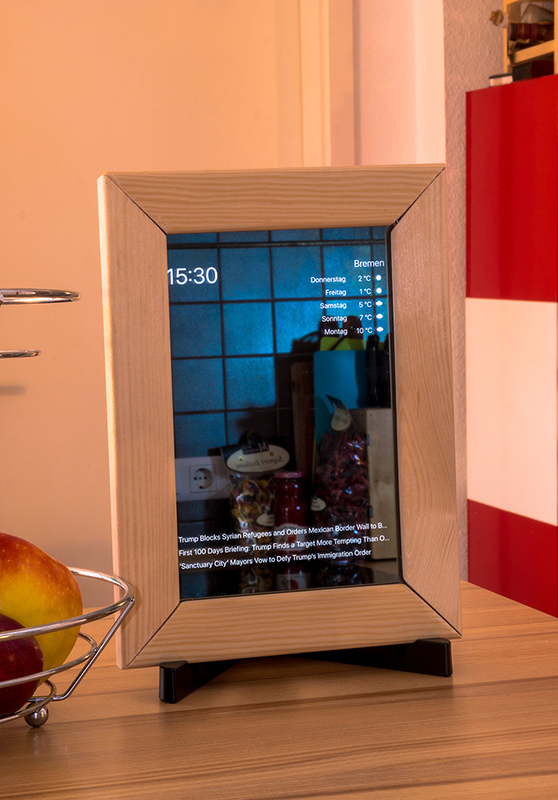 However, as I was looking deeper into smart mirrors, I realized that a normal sized mirror of this scale would cost me several hundred dollars, as you need a monitor to put behind the mirror, a raspberry pi to control the monitor, a lot of wood for the frame, and a two-way mirror that encases the monitor. Therefore, I decided to scale down my project and try to use materials I already own, instead of buying all of the required materials. I found an old family iPad 2 that no one is using and decided to use that as the system that will display the information. I looked around on the internet for people who did similar projects with an iPad and found this picture below. The goals I have for this project are that the iPad smart mirror displays useful information to me. I want it to display the time, the weather in Boulder (possibly a 12 hour weather forecast), my favorite sports team scores and schedule, popular sports news, and text and other app notifications such as email. This would require me to sync this iPad to my iCloud account so it can display my personal notifications. The aesthetic I want to incorporate into this project is a sports aesthetic. I am planning on engraving my favorite sports team name, Los Angeles Chargers, and possibly their logo into the wood frame. Another goal I have for this project is to increase my woodworking skills. I have not done much woodworking, so this project will allow me to cut, stain, and engrave wood. The above images show my personal sketches of my plan for the iPad smart mirror. I plan on using a two-way mirror in front of the iPad and using padding in between the mirror and frame and padding in between the iPad and frame to avoid scratching or shifting. This is awesome! I think using the iPad is a great idea! It will really simplify the project and will also allow it to have a strong operating system. I am excited to see how it comes out! How do you plan on setting up the iPad to display what you want? fascinating idea Tanner. I see your project is somewhat similar to Andrews but the aesthetics are different. So both of you can help one another in term of the technical stuff. your design is clean looking and very simple. an idea for the aesthetics is to somehow convey your sports interest in the frame of the product. This is a really cool idea. Sounds like a lot to take on, but will pay off. You have a very cool idea. Well done considering your constraints with much detail and finding ways to overcome them. I really like your design idea here! I think the wood frame creates a very clean and aesthetically pleasing look. I think one thing to think about is how you will attach all the wood corners together in a streamline way. It’s truly impressive that you were able to reduce the cost of this project by using some of the materials you have at home. Have you thought about ways to prevent the ipad from overheating? Really cool idea! Might want to incorporate a sleep mode because it might be annoying if its on at night. Try one way mylar film. It’s good that you considered your constraints. That will help moving forward. You may be able to find good scrap wood from the ITLL, Idea Forge, or other workshops.